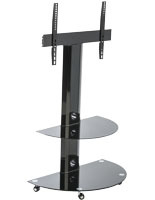 Adjustable tilting bracket for 37" to 70" televisions, weighing up to 110 lbs. 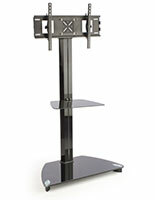 This plasma stand is the TV stand that will fully complement virtually any living room. 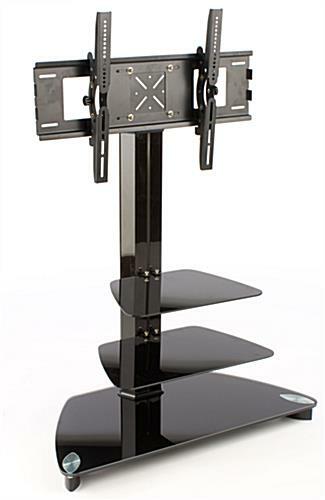 An LCD stand, TV stand has (2) adjustable black glass shelves. These optional shelves are perfect for holding DVD players, cable boxes, and game systems. This 54" TV stand, like a flat screen stand and a plasma stand, has a hollow pillar holding up your TV that can hold wires inside to keep them out of view. 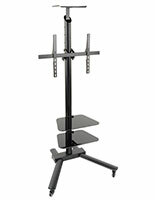 Included with this TV stand is the necessary hardware to mount your television to the bracket. 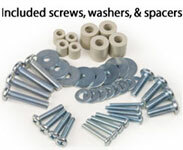 Some televisions may require specific screws that can be obtained at your local hardware store. This display is VESA compatible for 50mm x 100mm to 600mm x 400mm. This LCD mount can support brand televisions including Vizio. This TV stand can mount a 50" that will be able to be visual to everyone within the room. 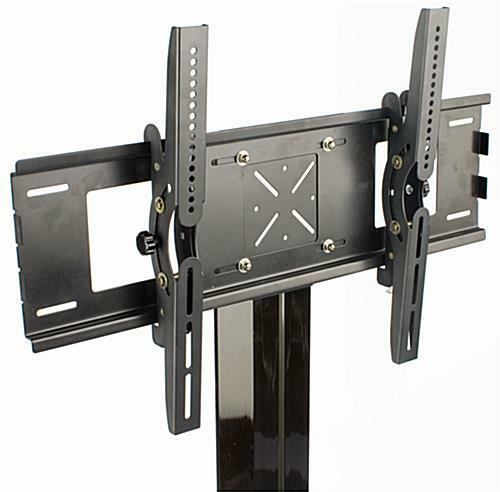 This LCD bracket is VESA compatible making it ideal for all generic televisions and sizes including a Vizio. 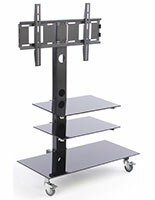 Mounting a 50" Vizio television to this TV stand is very popular in households as well as corporate offices. 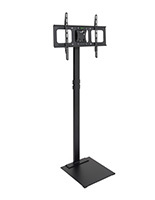 This LCD mount can be displayed in any setting because of its innovative black sleek composition. 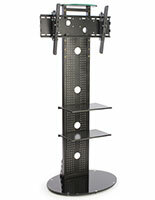 The TV stand features a tilting bracket that can hold a 37" to 70" television. 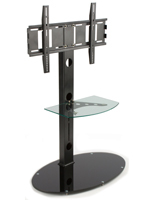 A tilting bracket allows you to angle your 42" or 50" television 15 degrees up or down to best suit your needs. 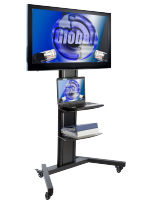 This plasma stand, TV stand has a heavy black glass base to help stabilize the stand. 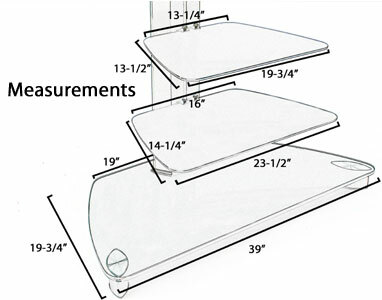 Feet beneath the stand elevate your 42" or 50" television to better viewing height, as well as helping to prevent scuffing from the glass base. 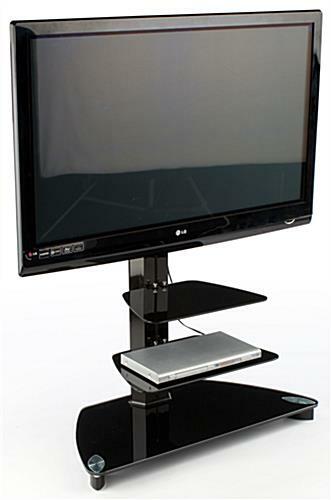 This TV stand, also known as a plasma stand and an LCD stand, is the best value you can find for the price made with these high quality materials. 39.0" x 56.0" x 19.8"
I agree with one of the other post's the directions that come with it are very very hard to make out, even the one on line is a joke. Nothing is really labeled the foam in my was all busted up, bag of screws all over the place, poor packing for the frame. Now the frame where the glass shelf's mount I am going to have to purchase something to go over the edges because they are very sharp and I could see not just myself getting cut but little kids fingers definitely. We're sorry to hear you're unsatisfied with this stand, Phillip. We've sent your feedback to our product development team to review, and one of our customer care specialists will reach out to assist. Thank you for letting us know! We're sorry that you are unhappy with your purchase. One of our Customer Care team members will be reaching out to you shortly.